The Audi e-tron five-passenger premium SUV is Audi’s first all-electric vehicle. It should hit U.S. showrooms in mid-2019, with prices starting around $75,000. And you can reserve yours today. The Audi e-tron finally puts Audi on the all-electric vehicle map. This first all-electric offering will be a midsized luxury SUV. It will compete directly against the Tesla Model X, Jaguar I-Pace, and Mercedes EQC 400. A unique enclosed platinum gray grille and four horizontal struts below the LED headlights will identify the e-tron as a fully electric Audi. Expect to see these design cues in future Audi electric vehicles as well. 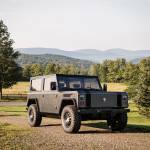 This SUV has two electric motors that are powered by a 396-volt 95kWh battery. A 150kW high-speed charging station can bring the batteries to 80 percent in only 30 minutes. 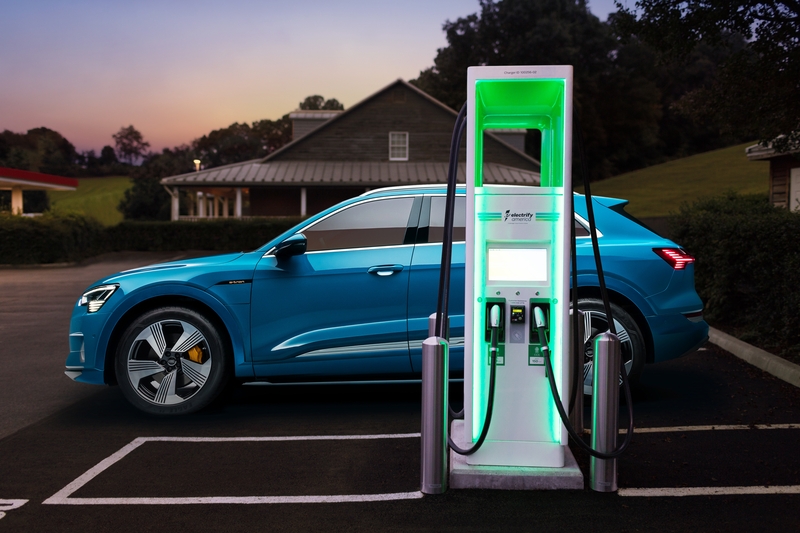 Included with an e-tron purchase is 1,000 kWh of charging at Electrify America charging sites during the first four years of vehicle ownership. By July 2019, Electrify America’s network of charging stations will include nearly 500 fast-charging sites. While we don’t know any horsepower or torque figures yet, Audi has announced some performance numbers already. You can expect the e-tron to hit 60 mph from a standstill in 5.5 seconds. It will max out at 124 mph. The Tesla Model X, Jaguar I-Pace, and forthcoming Mercedes EQC 400 all get to 60 mph in under 5 seconds. Only the Mercedes has a lower top speed than the Audi. Even though the e-tron might be a smidge slower than the competition, it should provide quite a sporty driving experience. A 50:50 weight balance will help keep the car composed in all situations. The speed-dependent air suspension, with adaptive dampers, should provide an extremely comfortable, composed, and even sporty drive when desired. Selectable electronic stability control, with both a sport mode and the ability to fully turn it off, also allows for maximum driver control. A new standard progressive steering system should also make the e-tron extremely easy to drive at any speed or level of aggression. The e-tron is not an off-road vehicle. But it should work well in harsh weather and on milder gravel and dirt roads. An all-new generation of Audi’s legendary Quattro all-wheel-drive system will provide most of the e-tron’s capabilities. The system uses the two electric motors to drive the rear wheels a majority of the time, but it sends power to the front axles when needed. And the e-tron should be capable when it leaves the pavement thanks to its selectable electronic stability control (with an off-road mode) and advanced torque-vectoring traction control. The air suspension, which raises the vehicle 1.4 inches in off-road mode, will also help with ground clearance issues. Impressive standard features are plentiful in the e-tron. The panoramic glass sunroof helps create an open, airy feel, and the four-zone automatic air-conditioning system ensures that all passengers are comfortable. With a cabin said to be extremely quiet, the Bang & Olufsen “Premium Sound System with 3D sound in the front” should provide impressive acoustical enjoyment. The interior of the e-tron comes standard with a whole host of displays and technology. The center stack consists of two high-resolution, touch-responsive displays measuring 10.1 and 8.6 inches, respectively. And the infotainment system is Alexa-enabled and can be fully voice activated. Audi’s latest virtual cockpit system, the gauge cluster is a fully configurable digital display that allows the driver to put what they think is the most information front and center. While not standard, you can get a whole host of luxury and tech features as upgrades on the e-tron as well. Air-conditioned seats with massage functionality are available. And so is a heads-up display that projects a ton of configurable data onto the windshield. 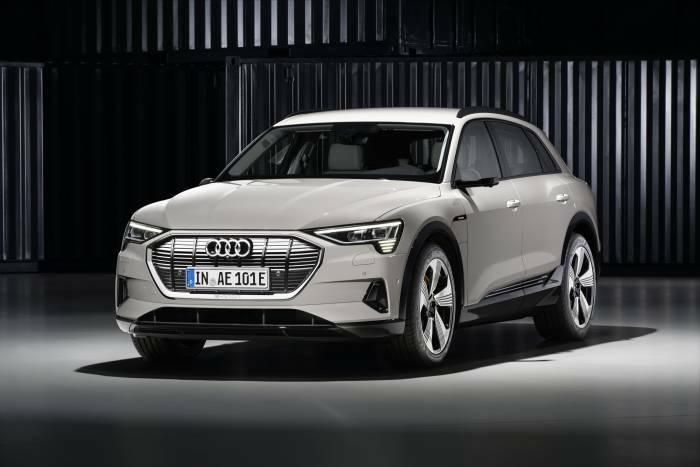 Reserve your Audi e-tron today with a “fully refundable $1,000 reservation fee” ahead of the mid-2019 vehicle availability. Prices start at $74,800 and go up to $86,700 for the First Edition e-tron. The First Edition is limited to just 999 vehicles in the U.S. It features a Daytona Gray exterior with Dynamic orange highlights and 21-inch bi-color black wheels. And the interior sports Black Valcona leather with gray contrast stitching and Volcano Gray Ash Natural Wood inlays.